The ultimate in Brain Food Cuisine, this 7-1/2 x 6-1/2 plastic mold of the left-hemisphere of a Human Brain will some fun to the typical boring Jello salad! 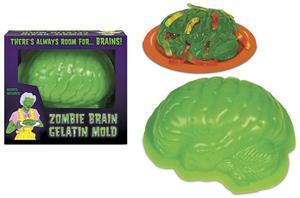 Comes with a recipe for making brain-colored gelatin. Perfect for Halloween or a Zombie-themed party!